Fold 'Ems Origami Paper - YASUTOMO-Fold 'Ems Origami Paper: Assorted colors. 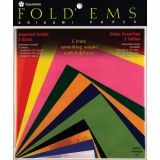 Create something unique with Fold'ems! This pack comes with fifty-five sheets of assorted solids in three different sizes: twenty-nine sheets of 3-1/2in, eighteen sheets of 4-1/2in and eight sheets of 5-7/8in square. Non-toxic. Imported.